Young Indians bought new hope & optimism of Brand Modi in 2014. Now they’re confused & angry as BJP government turns out to be Indira-era Congress, plus a cow. Brand guru Alyque Padamsee had a favourite boast: Clients ask me to reposition their brands. I tell them, I never reposition my brand. I just reposition my competitor’s brand. Alyque, unfortunately passed away recently. Or it would have been fun to go chat with him on how Narendra Modi and Amit Shah have done exactly the opposite: Blundered into becoming the opposite of the brand proposition that conquered the vote bazaar in 2014. In the run-up to the summer of 2014, Modi rarely spoke any words of negativity and none of pessimism. His message was strong, consistent, convincing: Development, growth, jobs, hard power, achche din (better times) on all fronts. He promised a clean, decisive, minimum government, with maximum governance. He talked of the future and how he would revolutionise it, particularly for India’s youth. If at all he brought up the past, it was the failings, policy paralysis, non-governance of UPA-2, the humiliation of its Prime Minister, the scandalous mess with environmental clearances and, indeed, its many scams. He wasn’t dividing or polarising. His campaign theme was: Sabka saath, sabka vikas (to be with all, and to enable all to grow). The underlying message was: I know the problems. I am coming with solutions. Give me the mandate, time and trust. It was a great product. It demolished its competition. Six months to go for the next elections, his message is mostly the opposite. He emerged as India’s strongest Prime Minister since Indira Gandhi, but now complains that the Congress doesn’t let him work. It even objects to his saying ‘Bharat Mata ki Jai‘, he said in the recent election campaign. So, the same 10, Janpath cabal that throttled Manmohan Singh, apparently, is strangling him as well, with just 47 in the Lok Sabha. He promised minimum government, but now flaunts his more sarkari schemes. Instead of listing corruption scams he busted and the guilty he punished, he plugs the many new and old alleged sins of the Gandhi and Chidambaram families. This, after 54 months in power and full misuse of the “agencies”. Instead of minimum government and a Gujarat-like entrepreneur-led growth, he is offering more handouts. He talks rarely of the future now, and is obsessed with the past-a very distant one: Jawaharlal Nehru, his father and daughter and Patel and Shastri. The promise of jobs, vikas, prosperity is shelved. Instead of unity, sabka saath etc., religious polarisation is the mission of the season. Yogi Adityanath and Shah are its heavy artillery. The jobless armies of youthful India while away time at village squares playing carrom, cards, or just smoking, chatting, or mostly watching rubbish on their Chinese smartphones with almost-free data. They are getting angrier and desperate. Are they willing to sacrifice it all, their aspiration and quest for self-esteem which brought Modi to power and now shift their heart and soul to protect the cow? It doesn’t show in the recent election results. If anything, jubilant Modi critics and activists are wrong in blaming these results merely on rural, farmer distress. Data shows the BJP has lost most of the cities in these states. The biggest, loudest and the most optimistic Modi supporters were the urban and semi-urban middle classes and unemployed youth. They aren’t fired by the call to resurrect Nehru in 2018 and then cremate him again. After the verdict of 2014, I had written that this is the rise of India’s millennial, non-ideological, transactional, “I-don’t-owe-you-nothing” generation. They detested entitlement of all kinds, especially of dynasty, and accordingly reduced Congress to nothing. Modi and Shah are now calling them to fight the same dynasty again. It isn’t working. The voter is bemused, and her question seems to be, lekin aap toh aise na thhe (this isn’t who I thought you were). In that genius 2014 campaign, Modi used a wonderful story to take apart Sonia Gandhi and her NAC’s welfarism. A farmer, walking through a forest, crossed the path of a hungry lion. The lion crouched to kill and eat him. But the farmer was calm. “Don’t be suicidal,” he told the lion, “or I will shoot you with my gun”. The farmer pulled out a folded paper from his kurta pocket and said, “here, sher bhai, not the gun yet, but Soniaji has given me a gun licence”. Thousands laughed and understood the message. That poverty, underemployment, aspiration today was not to be addressed with silly entitlement schemes, even if backed with rights-based laws (the gun licence metaphor). He also called MGNREGA the greatest evidence of (mostly) the Congress government’s failure for decades. Now he’s throwing more money into it, and offering more and more similar yojanas, Ayushman Bharat being his “gun licence” for the health of the poor. He defeated the dynasty in 2014, but embraced its political economy. His non-ideological voters, who made the difference in 2014 and until Uttar Pradesh last year, must be confused, and it shows. Arun Shourie was prescient in describing the BJP government as “Congress plus a cow” so early in its tenure. If anything, he was being kind. It is Congress plus a cow, but Congress of an older, Indira era. It swears by the public sector, shoving more taxpayer money into banks she nationalised, getting one PSU to buy another, maligning rivals as unpatriotic. 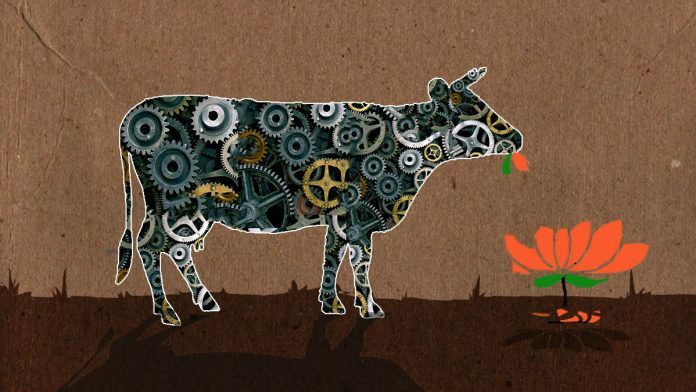 If Modi’s BJP is the old Congress plus a cow, where is the product differentiation? Okay, Modi, Shah, even Mohan Bhagwat aren’t dynasts. But what is so different and attractive about what they bring to the table? A fear of minorities? It’s a non-starter. The BJP’s one key promise was busting corruption. It is true that we haven’t seen major scandals under it and Modi’s titanium image for personal integrity is undented. But corruption lower down, where the citizen-state friction takes place, is worse than before. All categories of taxmen, given draconian new powers, targets and licence to be vindictive, are on a rampage. In Mumbai, for example, the old, Congress-style rent-seeking on building permits and property transfers seems to be back, and anyone you talk to is complaining. Of course, in whispers. Nobody wants a call from the taxman or a visit from ED or CBI. Meanwhile, what is the government’s record in scandal-busting? The 2G case has unravelled and all suspects acquitted. In coal, all Congress/UPA politicians and corporates have gone scot-free, while three innocent IAS officers have been jailed for doing nothing corrupt and that too under a law this government has repealed. Commonwealth Games, Adarsh, Air India purchases, all the storied scams that turned India’s politics upside down are forgotten, with no guilty punished, very few under trial. The government and its agencies have spent all their time fixing rivals in new cases, and failed at that too. Narendra Modi and Shah entered 2014 with an aura that there was nothing that was broken they couldn’t fix. Now they look and sound bitter, angry, victimised, vindictive, negative and are seeking votes against their comprehensively defeated opponents rather than for themselves. Why such a spectacular self-repositioning while on a winning ticket? Alyque Padamsee would laugh. 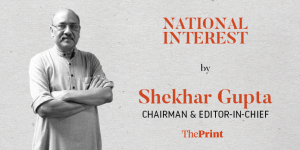 Good, in national interest now people like Shekhar Gupta are coming out in open and not whispers, more and more journalists will now have the courage to call a spade a spade? What’s the culture this Bhagwa brigade is inculcating among youths ? Gau Raksha , Ram Mandir and many more such thing we are teaching our youth . Where will such philosophy take them to ? It’s really worrisome . Hi Shekhar, This is a question for the Cut the Clutter program: Regarding the Supreme Court Judgement on Raffale Case: How do the Supreme Court Judges decide cases– do they live in the jungles- don’t they read newspapers– how can them mix up the Anil Ambani of Raffale case with Mukesh Ambani — such a mistake in a pvt organization would involve demotion if not firing. A similar mistake had happened in the decision of acquittal of Jaya Lallilatha. CM of Tamil Naidu. Ha! Come May 2019, I will put this article out and read out to you. After 15 years of incumbency you are not able to win straight against the incumbent, that requires soul-searching of the party that scraped through. Last December in Gujarat the media was going to town on how a cocktail of GST, demo, new dalit leaders, cotton farmers were going to upend the applecart. In Karnataka the electorate easily saw through the game of divide and rule of Congress a la Vokkaliga and Lingayat. Yeah, a new religion! The only elections which Modi have really lost are Delhi, Bihar and Chattisgarh (the last again after a 15 year lull.) I have never seen since my school days in the 1980s any govt at the centre losing so few state elections in their 5 years at the helm. Guptaji, control your exuberance. Modi will be back with a clear majority — if nothing else I’d rather root for a self-made honest, hard working, non-dynast. And am sure the voters will too. We take corruption only monetary wise. What about mind and soul corruption? ‘ Ali vs Bajarangbali’, ‘ Ramzan vs Diwali’ Such a division by PM and CM is also corruption of mind and soul. They are corrupting society. In 2019, they will get what they deserve. Empty stomach want food and jobs, not ram Mandir..
Modi is fixing what ain’t broken .MODI IS A FENCEPOST TORTOISE ! While stitching up the hand of a 75 year old Devon farmer, who cut it on a gate while working cattle, the rural doctor struck up a conversation with the old man. Eventually the topic got around to Gordon Brown and his appointment as Prime Minister. Not being familiar with the term, the doctor asked him what a fencepost tortoise was. Funny but unfair. BJP elected Modi as their PM candidate and bravely and transparently put him to the electorate, unlike Congress that has the tendency to impose PMs on India for the past few decades. It is Indian voters through an efficient and robust election mechanism who put Modi in the highest office. If and when Congress wins, Rahul Gandhi will NOT be the fencepost tortoise because the family has mastered the art of enjoying perks without taking any responsibility. And just for information, I am NOT a ‘bhakt’ as evident from my other comments on this brilliant article. An elected leader can be effective or ineffective because of his/her own style, traits and conditions in which he works. Churchill was thrown out despite winning WWII for Britain (the conditions had changed and a hugely conservative leader was not required after the victory). Trump is a hugely unpopular president despite his achievements and electoral victory, Theresa May has her failings, and her obdurate nature is very similar to Gordon Brown, who despite being brilliant at economics was a miserable leader. and, not to forget Dr Manmohan Singh who didn’t have the courage to resign and chose to remain a puppet PM of Sonia and her (then) incompetent son. Urjit Patel, a more humble technocrat has shown much more courage than MMS. Modi is FIXING WHAT AIN’T BROKEN ! In fact he is a FENCEPOST TORTOISE !! Who is a Fencepost tortoise ? While stitching up the hand of a 75 year old Devon farmer, who cut it on a gate while working cattle, the rural doctor struck up a conversation with the old man. You are slave of Modi / RSS philosophy so for you Shekhar is Girgit . Just wait for another 6 months , fake governance and fake government will be out . Adding to my earlier comment, some of us who strongly believed that a coalition driven government is ineffectual in bringing progress are now forced to admit that a majority led government is also NO guarantee of superior governance. Excellent!!! Even if the analysis may be a bit shallow, but there is a degree of truth in it. Modi is confused, and if there is no course correction (leaning towards sensible governance), may soon be a subject of mockery. Stand-up comedians are just waiting for the moment. Remember Dr. Manmohan Singh. Why this change of the article’s name? Was there an objection from the BJP? It’s good, as always! But we must fear a wounded tiger. We already have a precedent of a wounded tigress…Mrs Indira Gandhi 1975-77. The tyranny didn’t last long. Thankfully, India’s institutions are not as corroded yet to crumble under Modi. He may have to eat a humble pie and create his 1977 moment after 2019 elections. The column does not touch upon foreign policy, although 300 days have been invested in global diplomacy. The withering away of SAARC, almost all neighbours estranged. Fraught relations with other political parties, no glimmer of cooperative federalism. A swathe of the media that has forgotten the basic tenets of journalism. More than the branding / positioning, we should worry about the product. Modi lost his way and got trapped in his own promises of OROP and Rahul’s barb of ‘Suit boot ki Sarkar’. He need not have alienated persons like Shourie or Y Sinha who could have given correct guidance. With OROP outgo, hardly any money is left for defense purchases. And with loan waivers,no money is left for infra improvement in Agriculture sector. Even if only the last was done,he could have retained urban voters. …and all “skill training centres” should teach them how to milk a cow. Modi is as corrupt as they come. Do not try to give him a clean chit. In addition, he is communal and incompetent. What would do you expect of an illiterate RSS bigot ? ?